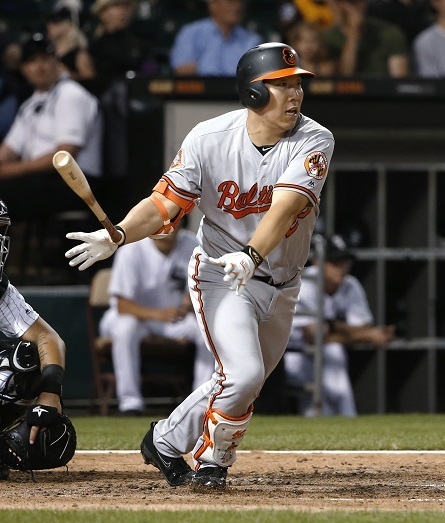 For a second consecutive season, Baltimore Orioles left fielder Kim Hyun-soo has found himself fighting to hold down his starting spot. But compared to last season, stating his case in 2017 has proven to be a struggle, as his offensive production has unexpectedly deteriorated. Last season, Kim’s spring training struggles lost him the confidence of manager Buck Showalter and he was relegated to the bench. However, he was productive in a platoon role, hitting .302 with a Weighted Runs Created+ of 119, indicating he was 19 percent more productive than the average major league hitter. In 2017 however, Kim has not been able to replicate that success. He enters the All-Star Game break hitting .229 with virtually no power, and a paltry wRC+ of 56. His worsening results, however, do not appear to be the result of changes Kim has made at the plate. His batting stance is the same. He has maintained the plate discipline that is one of his greatest assets and he has continued to draw walks at an above-average rate. He is still hitting the ball to all fields -- with a slight preference to pull -- and with the same authority -- his percentage of hard-hit balls is down slightly, but balanced by an increase in line drives hit. The biggest change is that Kim seems to have gotten incredibly unlucky with where his hits have fallen. His batting average on balls in play is a staggeringly low .280. While it is an oversimplification to say that bad luck alone accounts for Kim’s low BABIP, theory dictates a hitter will tend toward his career average in BABIP. Kim’s 2016 BABIP was .345, and he ran a .331 figure in his 10 seasons in Korean professional baseball, so, with no changes in his batted ball profile, it is fair to assume Kim has been at least somewhat unlucky. As for his drop in power, it is important to note that Kim has only 134 plate appearances in the 2017 campaign so far. Power numbers often do not begin to stabilize until around 500 plate appearances, and given that prediction systems like ZiPS and Steamer see Kim‘s performance rebounding in the season’s second half, it appears that for now there is no reason to worry, and Kim’s early slump is attributable mostly to plain bad luck.